2014 Recap: what a year it has been! Last December at this time we were driving home from Virginia and maximizing the car time to goal plan for the coming year. We had hopes, dreams, and items to check-off our ‘to do’ list. We were ready and excited about the coming year! I’m so thankful we didn’t know then what we were driving back to. We got home and almost immediately faced cancer (again). Suddenly our hopes and goals went out the window and each day felt like the best we could do was just get through it. And get through it we did, all by God’s grace. Spring rolled around, the snow melted, the hair slowly grew back and we got the good news of ‘all clear’! After having had to postpone all adoption plans we were eager to get back to it and get all the updated approvals we needed. Summer came and it looked like we would be able to bring our boy home in September. We started hoping and dreaming and prepping for another son. Little did we know that by August we would lose our referral and be back to square one. Telling our kids the sad news was miserable. Their tears and ‘why’s’ echoed what we felt in our hearts, too. Why had we gone through so much and come so far to get stopped once again? Only God knows and again, it felt like the best we could do was just get through one day at a time. Leaves fell and autumn emerged, both kids were in school full-time. My life did not look at all how I had pictured it back when we plotted out 2014 goals. So now what? We decided it would be best for me to get another job and try to embrace the season of life God had given us. Adoption was put on the shelf indefinitely as our agency made it clear that our odds were not good. Back at the end of 2013 I had written in my journal that I was praying God would be glorified in our new year of 2014. What I meant was that I was hoping our adoption would speed through in record time and amazing ease, all to God’s credit. I certainly did not picture God receiving glory through our struggles! Glory came through victories! Well, God is good and he was glorified in our 2014, struggles and all. He carried us through a really scary time of cancer. He strengthened our marriage as we sat side by side at chemo. He grew the character and faith in our children as they watched sickness and then health restored. He surrounded us with community, both old and new, that supported us, loved us, and prayed us through to clear scans. God is good when we lost our referral and through tear-stained cheeks he gave us a sense of HIS peace. We had confidence that if God wanted that boy to join our family, then he would have made a way. For whatever reason that way was not made and God was glorified as we learned to trust him more. God was glorified when we broke the news to family and friends and they responded with love and not anger. God was glorified when our kids decided to still earnestly pray for sweet boy, knowing he would now not be their brother, but trusting God would give him a family to love. God was glorified most this past year when through all our struggles we learned to trust him more, no matter the circumstances. I would like to hope 2015 would be an easier year in comparison. I am all too eager to say goodbye to 2014!! But, I also know that no matter what is in store for us this coming year, we will be okay because God is still God and his love endures forever. You know what? I bet you had a crazy year, too. Maybe you faced struggles, transitions, health issues, loss, and unmet expectations. Maybe you are headed into a year of difficult circumstances and are wondering how you will make it through. I don’t have any grand words of wisdom, but I can say with confidence that God’s grace is sufficient and his love is enough to get you through each and every one of those days. He is most glorified in our lives not when when everything is picture perfect, but when we truly trust him in all things. My prayer for you is that no matter how crazy and messy your year was or will be, that you would experience the never-stopping, never-giving-up, always and forever love of Jesus. His love that would come to this messy earth to live among us and offer the greatest sacrifice to give us a HOPE. One of the best moments of this past year happened on a muddy river bank, serving as a visual reminder that it doesn’t matter the mess we are standing in ~ God is glorified. MissE made the decision to be baptized, professing her faith in Jesus as her Savior. Happy New Year! May you experience God’s love and faithfulness in 2015. Here she is on day one. And here she is as a 1st grader!! Woohoo! We celebrated with dinner and a night out at an indoor climbing park. We are proud of you, girl! And now we will spend the rest of the day watching the video over and over again, looking through the year’s portfolio, and writing ‘I miss you’ cards to friends. Transition is never easy. Thankfully, we have the For the Kids Carnival on Sunday to look forward to!! Do you remember the locker room? Well, after a lot of hard work it no longer looks like this. Let’s talk about the hard work first. My mom and I spent an entire day peeling off wall paper. Let this be a lesson to all people. Do not use wallpaper. Just don’t. Then my dad filled in the countless holes in the wall (some from screws, some from my digging at the wallpaper with a knife). Next, James and a friend sanded the entire room. Let this be the next lesson for all people. Do not use textured paint. Just don’t. And if you feel that you absolutely love textured paint. Use it in one room, not the entire house. Okay, so after the walls were peeled, sanded, and prepped it was time to paint. We found this lovely shade of purple in oops paint and there were two cans. Side note, when using two cans of oops paint, mix them together before painting to insure color consistency. Or if you want to be like us, don’t mix them and end up having to paint the walls three times. If you like painting, maybe this is your better option. All kidding aside, after A LOT of hard work. The purple princess room is ready and being occupied! It is a little girl’s dream. I’m happy, she’s happy. On to the next room! Who wants to come help me paint? Our baby girl turned six! Where has the time gone? This year we threw her an actual party, with eight friends and a brother. Here is the ‘craft’ table all ready to go. That’s right, I planned a craft. What has the world come to? Next came team games. Let me introduce you to the Speedy PJamie Tigers. And the Chocolate Chip Pancakes. And our unfinished basement. They are off on the pajama shuffle, wearing mom and dad’s robe and slippers. Later there were musical pillows. I can’t remember who won this game?? It’s hard to tell. Then it was on to Pinata aswesomeness. James rigged the pinata so it would go up and down as well as side to side. Here the kids are formulating their plan of attack. It was harder than they thought, but even more fun. I made cupcakes with the best frosting ever, but don’t take my word for it, just ask the Pioneer Woman. It was a pajama party. Bed head required. It was a fun time and MissE declared, ‘the best day ever!’. Even better considering she had the afternoon to play with new toys. The room is now a pretty shade of purple and ready to be transformed into “Tinkerbell’s World”. This is what MissE exclaimed after seeing the finished color. Good thing we had already bought that Tinkerbell’s bedroom set for her upcoming birthday. I really do. It is a tiring job for sure and I have the circles under my eyes to prove it. But, there are those moments that make it all feel so worth it, like I won the lottery of life. 1. Watching her read chapter books and I mean speed-read, just like her momma. Her goal was to read a book a day. I think she made it through 4 books and then lost steam. Still, 4 chapter books in 4 days is a feat for a five year old. I can’t wait until she sees what we got her for Christmas. Ssshhhh. It’s the Felicity book series. 2. Taking her to the secret shop at school to buy Christmas gifts for all of us….all by herself. Ah, she knows what I love! I can’t wait to see what she bought us, either! I feel like a kid again, longing to shake the packages and see if I can peek in through the cracks. ~ I’m not sure what to do here. Any tips? On one hand I absolutely love her resolution and pure faith. On the other hand we don’t know her teacher, I have been a seriously delinquent parent as far as school goes, and I don’t really want the reputation of being one of *those* families. Although, truly, we probably are *that* family. 4. 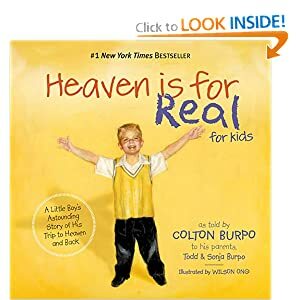 Lastly, I picked up the book Heaven is for Real for kids from the library. MissE has been pouring over the pages. I wasn’t all that impressed with the book and was somewhat surprised when I realized she loved it. She has been talking about how she can’t wait to get to heaven to see God. Her enthusiasm is contagious. I look forward to heaven, too. This is a good life we have here, but this is definitely not our best life.